Have you ever been challenged to do something way out of your comfort zone– so far out that you don’t even think it’s possible? That happened to me last summer when I signed up as a volunteer for Zoie’s church camp so she would feel more confident about going and having a great first experience. When they first approached me to lead a group of eleven, seven-year-old girls, I was a little skeptical. Can I really do this? Better yet…do I really want to do this? I was thinking more like “kitchen helper” or “activity planner” who then simply watches from the sidelines. My son always tells me I would have made a great cruise director, but team leader came with major responsibilities. That meant sleeping in a bunk bed surrounded by dozens of kids that don’t really want to sleep. I’d spent summers over a span of ten years counseling at a popular sports camp, but THAT was during my college days. Surely I can survive three days playing pirates, I thought. I said yes, but still felt consumed with thoughts of insecurity: Will I be any fun for these second and third graders? Will I be able to keep up the same camp spirit I sported all those years ago? Fifty is getting a little too close for comfort for me. There was a special side note in the itinerary: Bring two shirts that will get dirty/ruined from mud activities. The first night, I dove right into camp, and with it, the pasta they served us (before asking what was “in” the pasta). I’m extremely allergic to beef and pork and found myself in the nurse’s station an hour later receiving large doses of Benadryl. It was day one and the only “loot” I had discovered was what I threw up from that meal– definitely not the start I’d hoped for. And plus, now I was drugged. That night, I slept like I was in a coma. The next morning, I felt groggy but ready to face the day. It was lake and mud day so I changed into my ready-to-get-ruined outfit and, I will be honest, I was nervous. What grueling activities are coming up and will I keep up? 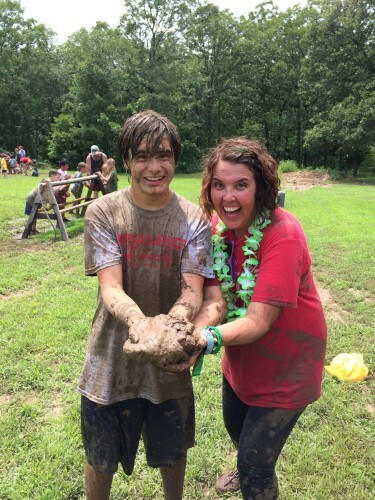 Here’s the funny thing: something came alive in me and I could feel the excitement and exhilaration as I ran toward the mud field with my campers! Finally, I could tell this was going to be an absolute blast! This was going to be a great adventure and I wanted to make sure every camper was having fun, covered in mud, and each of their outfits ruined just like mine. I had the day of my life. 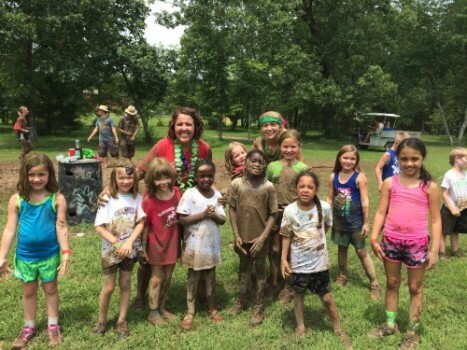 I was definitely not too old to play in the mud or paddle a canoe at the lake for joyous campers. There might be a debate about who was having more fun: me or the kids! I’m so thankful I didn’t stand on the sidelines and watch but rather jumped in and lived out loud the fun! If we’re going to be world-changers, we have to be willing to get involved and get a little muddy. And we have to be able to encourage others to jump in with us. We are all called to simply love, but “how” we do that will look different for each of us. If you are feeling stuck in the mud, I want to encourage you to find your new adventure. Whether you’re 18 or 80, let’s keep living life out loud and with significance in this big, wide world. Let’s do this crazy life together and encourage one another to live boldly and love big, as Pastor Don taught last weekend at the Keller campus. So, that night after a long, get-all-the-mud-off shower, I thought about the day and the muddy lessons I had learned. We have an exclusive passport to be an adventurer on God’s journey. 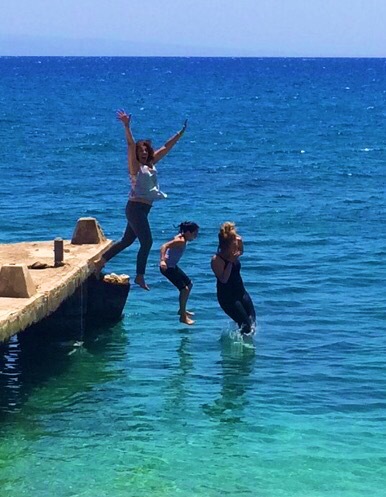 I’m not talking about jumping out of planes or deep sea scuba diving (you wouldn’t catch me doing any of those things), but when it comes to a God-adventure, we want all in. You have been ordained with very specific gifts, passions, and talents from the Creator of the Universe. He has big plans for your life. Always be willing to say yes to His journey. I promise it will be more thrilling than all of your own, self-imagined adventures combined. Action is the best way to show others how to gear up for fun. Watching you celebrate life will have a profound impact on them. Make everyday count and, in the midst of stress (it’s easy to get stuck in the mud when you’re going through a stressful time), surround yourself with community– especially when you feel those top triggers of stress, anxiety, and loneliness. Find ways to connect. Volunteer in an area you are passionate about. It’s hard to stay stuck when you are loving and serving big. Life is hard. I can tell you a dozen stories right now of people I know who are going through really difficult hardships. Divorce, court cases, death, sickness, abuse, loneliness, heartache and loss. When life is beating you up or you see others going through dark days, what can you do? Encourage. Pray. Support. Bring joy. Pray bigger. Keep walking. This is probably my favorite, because if we are going to be world-changers, we need supernatural creativity and unswerving hope for the future. It doesn’t matter what season you are facing: school, mommy-hood, or an empty nest, there is a place for you. Don’t give up, but pray fervently for God to open new doors of significance to love big. I love being a cheerleader for people and ministries that are world-changers. Let’s be honest, it takes an enormous amount of energy and time to serve on the mission field, or put together an event to raise money for humanitarian projects, or volunteering, or serving in your church or reaching out to your neighbors. Let’s be a community of fans and cheer loudly when we see someone stepping out in faith with action to show the love of Jesus. What are you doing to live bold and love big? How can you make a difference in your community? Thank you for the challenge to live boldly!